This is an overview of the 3D Buildings layer in Google Earth as it currently exists with Google Earth 5. 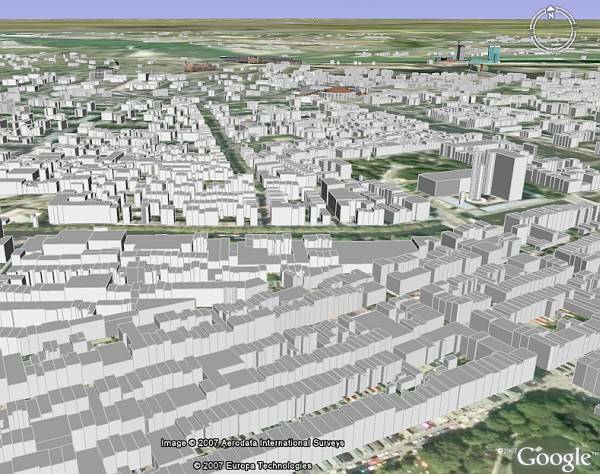 The 3D Buildings layer has evolved a great deal since Google Earth was first released. In the early days, Google only provided simple 3D gray buildings with no color or photo textures (see example). Over time, as Google Earth graphics capabilities advanced, the 3D Buildings layer models have become much more realistic and interesting. You can now find many complete 3D cities rendered in photorealistic detail in the layer for Google Earth. One of the biggest detailed examples is New York City. The 3D Buildings layer folder actually has two sub-layers: Photorealistic (models with photos applied to add complex details and colors), and Gray Buildings which are 3D geometric models without photo textures or colors. The latter usually came from GIS databases provided to Google by cities or 3D city database companies. Eventually Google acquires photo data for these gray cities and adds the photorealistic details to the models. GE has really begun to outgrow the “3D Buildings” label because the layer also includes many other kinds of objects such as: sculptures, bridges, ships, and even whales! Maybe “3D Objects” would be more appropriate? The 3D models in the layer actually were built by many different people and organizations. Google actually encourages people and organizations to make or upload their favorite 3D buildings and upload them to the Google 3DWarehouse. You will find many 3D buildings all over the world in Google Earth – most of them have been built by people using SketchUp and uploading them to the 3D Warehouse. The ones which get included in the layer are picked by Google and have to adhere to basic guidelines (see some examples of the criteria for selection). You can also view the many thousands of 3D models people have placed for viewing in Google Earth in the 3D Warehouse by viewing the new 3D Warehouse network link. Some of the models you will find, are already in the 3D Buildings layer, but there are many which either don’t meet the criteria, are duplicates of the same model, are fantasy models, or just not appropriate for Google Earth. But, some of them are entertaining anyway. For fun, just check out the many 3D objects for Google Earth written about in GEB over the years (many of which can still be downloaded and viewed in GE). 3D buildings does not work with PCs having more than 3GB Ram. Why is this? I have 6 GB RAM installed and 3D buildings works only if I reduce this to 3GB in my startup/boot options. System: Vista Home Premium SP1, Intel i7 processor, 6GB RAM , Geoforce GTX260 Graphics card, Google Earth 5 latest (not beta). This is a known (at least by users) issue with Google Earth. Check out http://www.google.com/support/forum/p/earth/thread?tid=07ac6ed2d01bd374&hl=en and add your voice to the thread. We are working on a project on Monhegan Island ME to put up a large wind turbine. Several people asked if we could put it into Google Earth with surrounding structures. I built several photorealistic models and submitted them to the 3D warehouse. How long does it take Google to review them and will I be told if and when they are accepted? I could just explain to people how to use Sketchup and add them themselves, but for many users, this will be complicated and for casual visitors to Monhegan in GE, they will not see them. Why do my 3-D gray building appear to hover above the ground and how do I fix that? I have had the same problem as the first two people in this comments thread. 3d photorealistic buildings are my favorite visual feature on Google Earth, but unfortunately, with my new system, which has 6 gb of ram, they all load blurry, incomplete. The link you, VS Dude, provided, is great, and has lots of temporary workarounds, but it concerns me that the thread is 5 months old and has not gotten a response or a fix. Google Earth needs to properly work with systems that have in excess of 4gb of ram. It just doesn’t right now. My computer is almost one year old now – and it came from Dell packed with a Quad 64-bit processor and 8GB RAM. All this horsepower renders Google Earth with 3D buildings that are mapped with blurry images for the building sides and details. The latest GE build that came out a week or so ago helped most of the buildings appear better than their gray-only appearance beforehand but they’re sorely lacking in detail when comparing them to a system with less than 4GB RAM. When my father-in-law visited me last weekend and wanted to see what the view would be like at a particular seat at Safeco Field in Seattle, I pulled up Google Earth but quickly closed it and reverted to MS Virtual Earth’s 3D rendering because, on my system at least, it renders reliably and clearly. I love Google’s other products and, even though GE has faults, I do love the built-in Street View bubbles. I really hope Google can get this fixed soon. It’s been dragging on far too long now. I can’t get GE to install on my HP1907 with Vista 64-bit. No errors, the install simply completes and there are no GE shortcut or libraries. I’ve tried it with IE8, Chrome, and Firefox. Any ideas? Do you know what database is used for storing and retrieving Google Earth 3D models? The new 3D buildings look great! Just a question though: why are there still a few buildings that are still gray blocks in Manhattan? I have the same question as David above, does anyone know this ? Why can’t I see 3D buildings in Indian cities even after checking 3D Building layer in Google earth? Do I need additional plugin?